Landscaping adds interest to your home, whether you choose to do just a small area in your front yard or create an entire themed landscape in your backyard. Creating the perfect look involves gathering the right plants and materials to design the yard you desire. 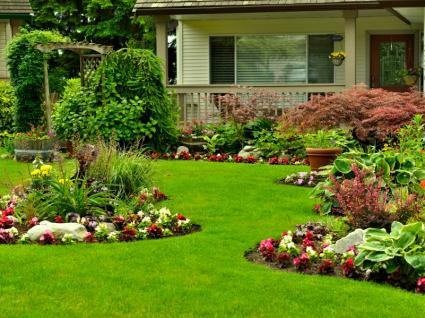 Front yard: Landscaping in the front yard might involve creating eye-catching areas near a flagpole, mailbox, or tree. Other designs may keep it simple, with landscaping near the porch or walkways. Backyard: Larger landscape designs are usually done in the backyard. Privacy is often a consideration here. Special situations: Creating a particular design can also help when you have unusual considerations, like working with a sloped yard or you need to reduce grass. Browsing pictures of landscapes is a great way to determine what might work in your yard as well. Get creative with the expert tips and ideas you find at LoveToKnow Garden Landscaping. Plants: Use a plant guide for your gardening zone to determine the best plants for your design. Consider your zone, yard conditions, and style before making your final choices. Ornamental grasses, flowers, shrubs, and trees are all plants that may end up in your landscape design. Supplies: Learn where to find lava rocks or how to calculate pavers for your patio space that's being incorporated into your new landscape with the articles in this category. Create a beautiful yard using the design ideas and materials suggested and vetted by the team of gardening experts at LoveToKnow. Regardless of what your yard looks like now, you're sure to end up with a design you'll love to spend time in when you're finished.